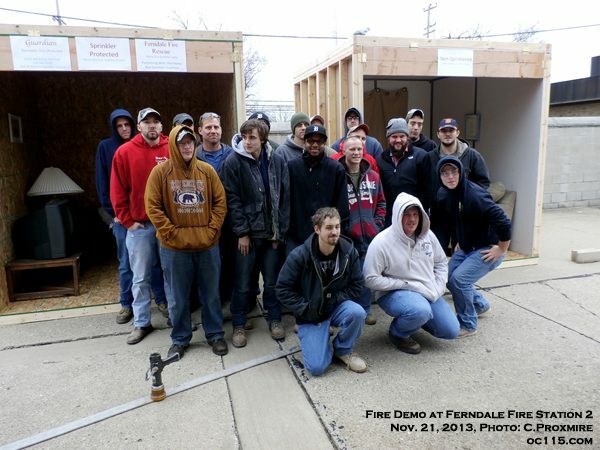 Students from The Detroit Carpentry Apprentice Training School in Ferndale got a first-hand lesson in fire prevention on Thursday as they watched a side by side demo of two residential rooms in flames. One room had a sprinkler installed, while the other did not. 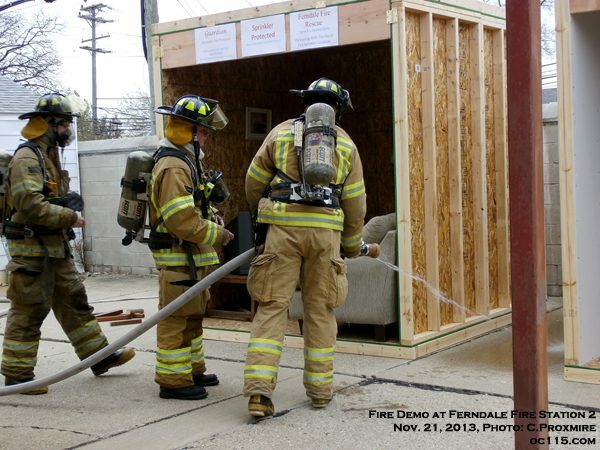 Without a sprinkler system, a room became a den of fire and destruction in less than four minutes from when a small flame was lit inside a trash bin. 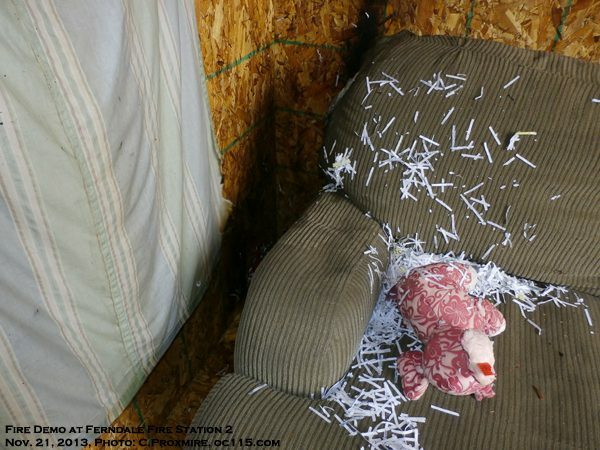 The curtain and couch were engulfed and the stuffed teddy bear did not stand a chance. The television and the printer melted, and the coffee table was nothing more than kindling. A similar fire started in a room with a sprinkler, however, did significantly less damage. 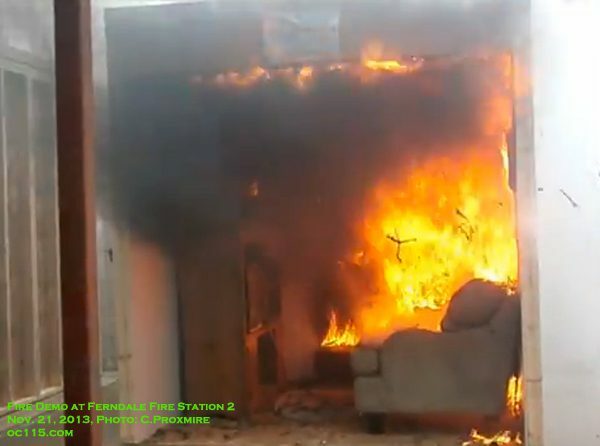 While the waste basket melted away, the fire left only charred spots on the curtain, the wall and one arm of the couch. Items in the room got wet, but not entirely destroyed. And most importantly, had there been people in that room they would have had a much better opportunity to escape. 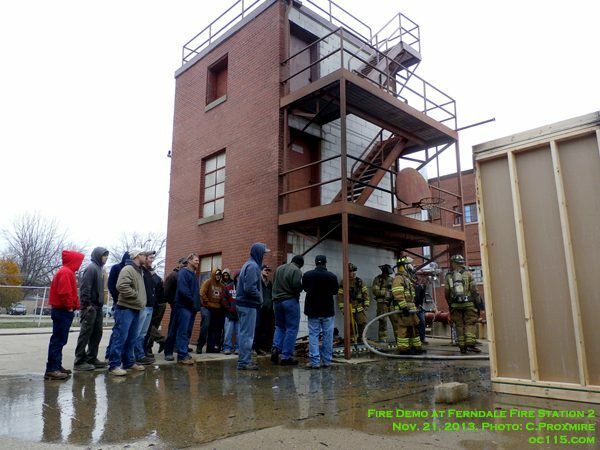 The demos were put on thanks to a $1,500 grant from the Home Fire Sprinkler Coalition. 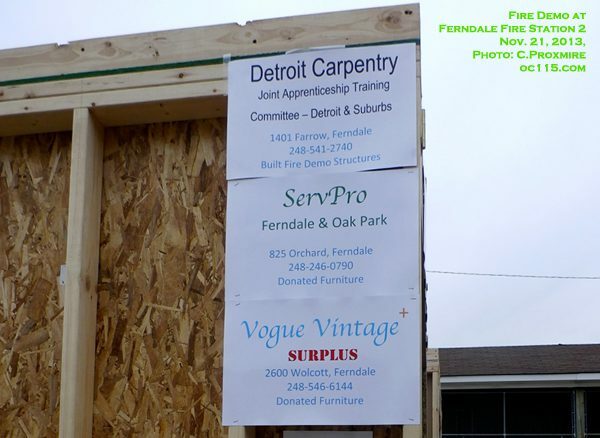 The Detroit Carpentry Apprentice Training School built the two demo rooms, in addition to being there to learn from the controlled burn. ServPro and Vogue Vintage Surplus donated the furniture, and Guardian Automatic Fire Protection in Oak Park donated the sprinkler system in the protected room. 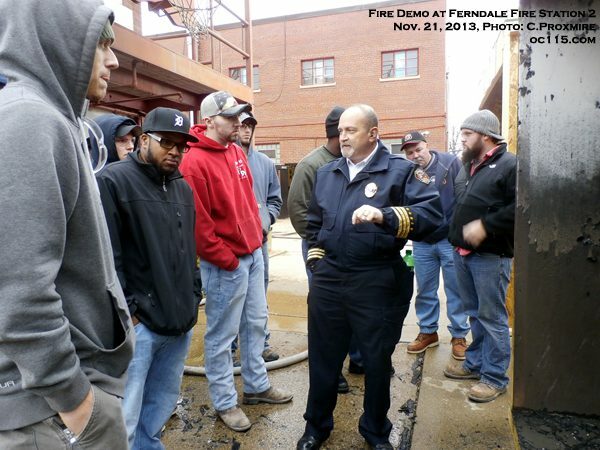 “The burns you witnessed today were to show how quickly a fire progresses and why fires continue year after year to kill around 3000 people a year,” said Ferndale Fire Marshal Brian Batten. 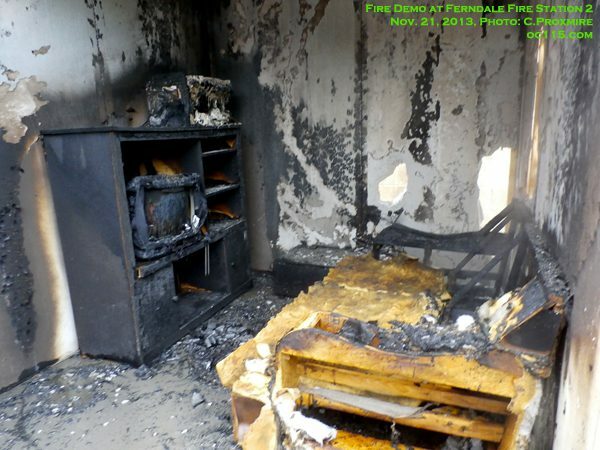 “Even with smoke alarms in your home, there is a danger you might not react in time to get out. Not to mention the valuables and irreplaceable items you lose in the fire.” He explained that sprinkler systems are “green” in terms of economics and the environment. People with sprinkler systems tend to pay less for insurance, and have less to replace should a fire occur. A sprinkler system-controlled fire uses less water to extinguish, releases less toxic smoke into the air, and sends less waste to landfills. Home fire sprinklers can contain and may even extinguish a fire in less time than it would take the fire department to arrive on the scene. Modern residential sprinklers are inconspicuous and can be mounted flush with walls or ceilings. Sprinklers are not required in Michigan, though they are recommend in model codes for new construction. Batten said that in Michigan local municipalities cannot include sprinklers in their code for residential construction until it is approved by the state, however builders can put them in if it is what the property owner requests. They can also be added to existing homes. For those who can’t afford sprinkler systems, there are other ways to increase the chance of surviving a house fire. Being mindful of potential fire hazards is the first step, such as taking care when cooking, disposing of cigarettes properly, and not leaving candles and incense unattended. Smoke alarms should be placed throughout the home, including both inside and outside of each bedroom. 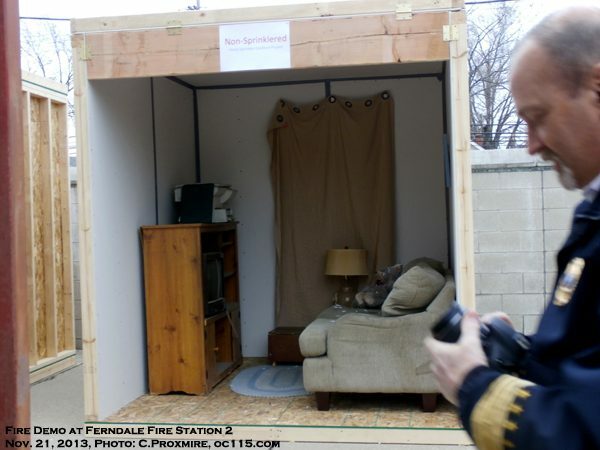 Sleeping with the bedroom door shut increases the chance for survival as the door acts as a barrier to keep fires contained. And having a plan of escape with multiple ways out is also recommended. The Home Fire Sprinkler Coalition specifically reaches out to people in the building trades to encourage them to install sprinkler systems in construction projects. Find out more at http://www.homefiresprinkler.org/.